There’s something about houses in the middle of nowhere. In some respects I can see the attraction of living in a modernist box surrounded by trees, although clearly in practice I’d miss the tube and being able to get to galleries and theatres and the cinema and decent shops and, oh, the list goes on but it gets too boring to type. In the end though, surprisingly, it’s not fear of not being in London that’s the biggest factor, it’s the fear of just not knowing what’s out there. Okay, so being in a hermetically sealed glass box might be warm and safe but if you can’t see what’s outside, well, it could be anything. In Michael Raedecker’s Ins and Outs in some way the threat seems to come from within. 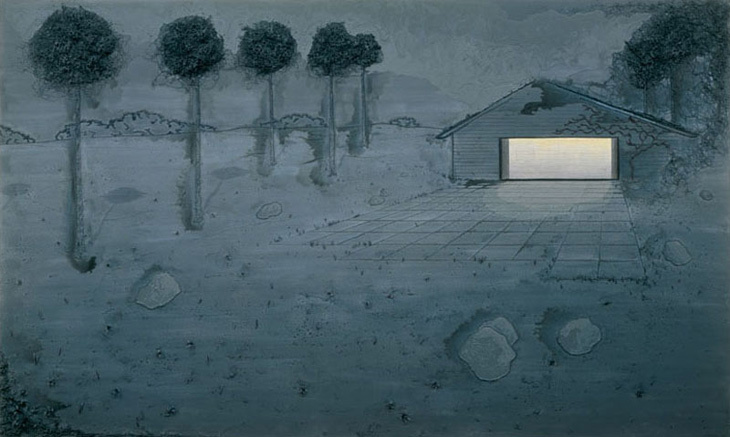 The glow of light from within the building – a garage by the look of it , or possibly a house with a large picture window – seems too blank. We are blinded by it but it doesn’t illuminate the interior. Somehow the light seems to break the rules. It should be a welcoming beacon shining through the darkness; instead it seems alien, somehow otherworldly. In Beam, the building is at least easier to read. It is slightly a run-down barn-like building. There are no signs of life coming from within. But here again the light in the painting is strange. The trees cast abnormally long shadows. It seems to be night time but the shadows don’t seem to be cast by the moon; when is that ever so low in the sky? In all of Raedecker’s work, part of the oddity of the image comes from the media he employs. Beam and Ins and Outs are both landscape paintings. They are painted in acrylic on canvas, but the details that make these landscapes strange – that bright glow and the foliage on the perfectly spherical treetops in Ins and Outs or the tall bare trees in Beam for instance – are stitched into the paintings. This combination of paint and stitch is an unusual one and is something Raedecker uses to extraordinary effect. 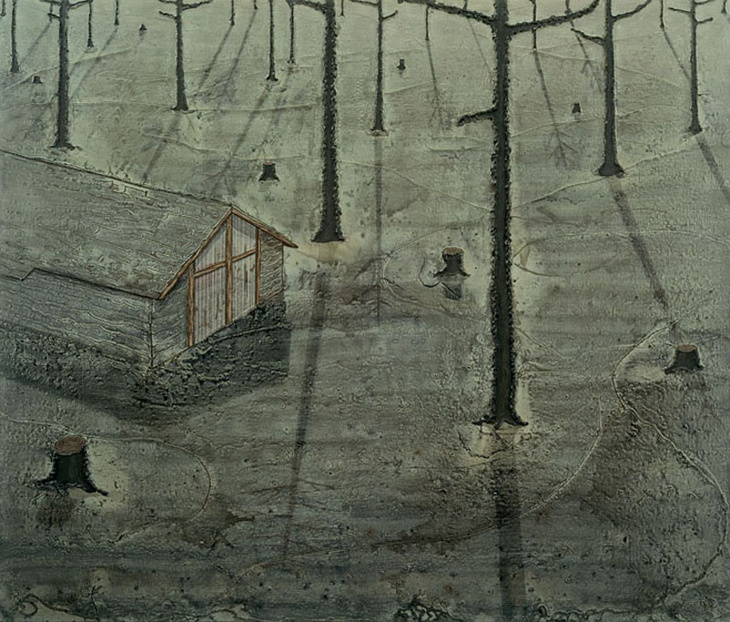 This is work that needs to be seen in real life and, though I’m not as excited by his new work as by the landscapes I’ve included here, his exhibition at Hauser and Wirth is definitely worth a visit. This entry was posted in Painting and tagged art, Beam, film, Ins and Outs, landscape, Michael Raedecker, painting, stitch by Ann Jones. Bookmark the permalink. See my comment on the next post!